This week's Throwback Thursday, we turn our attention to two Head Coaches in the Arena Lacrosse League, Joe Sullivan of the Peterborough Timbermen and Ron 'Mouser' Henry of the St. Catharines ShockWave. The Timbermen have clinched 2nd place in the ALL with an 8 and 4 record; the ShockWave have booked their spot in the ALL Final Four Weekend, Saturday April 13 and 14th at the ILA in Hagersville, sitting atop the ALL standings at 11 and 0. 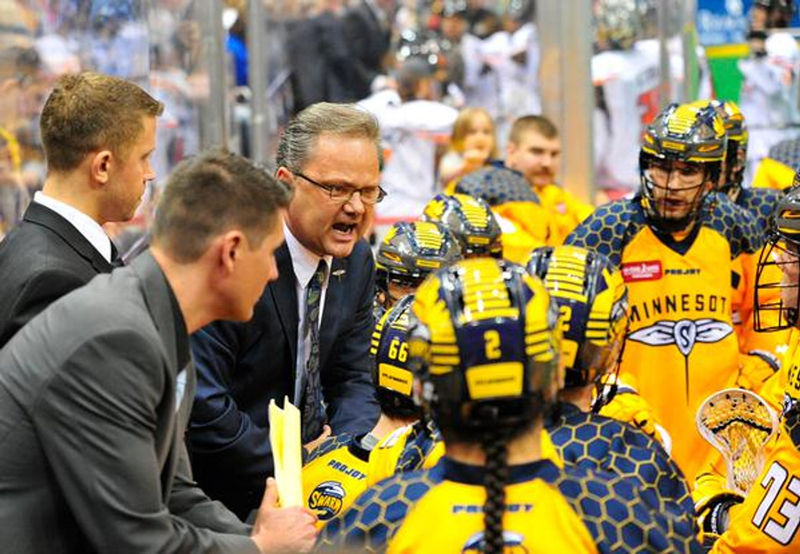 In this interview we catch up with Joe Sullivan pictured here with Minnesota Swarm of the NLL, prior to their move to Georgia. (please click here for Ron Henry interview). Sullivan: Brings back the memories of the great team and battles we had together in the NLL. When you battle together you grow together, that’s what fuels the fire for great players. It was a family atmosphere that can’t be explained unless you’ve been part of it. 2. You look animated in the photo, like your trying to fire up the Swarm, as a coach do you pick your spots when to have these type of discussions or does the game dictate these moments? Sullivan: As a coach I always try to make it fun, but more times then not there comes a time when your players need a shot of energy and that’s key that a coach knows when and how far to push. 3. This picture is of you as the Head Coach of the aforementioned Swarm when they were in Minnesota, what experience from that time frame have you been able to bring to the ALL and your Peterborough Timbermen? Sullivan: It’s my hope when I reference my time there with my players that they feel the passion and how an incredible experience it was. I want that experience for my current players. They work so hard to be treated like an ultimate professional it is a great feeling when players move up. For them to be able to run on to the floor an hear their name announced is a feeling that they will never forget. 4. Everyone always talks about how coaches can develop players to get to the next level and recently you have seen that success with the Timbermen as Colton Armstrong, Cameron Simpson and Nick Damude all signed contracts with the Rochester Knighthawks, can players play a role in developing coaches for the next level? Sullivan: Absolutely I learn every time I’m with my players. If a coach listens to his players, he will better understand the experiences they are dealing with on and off the floor. The best coaches know the pulse of their team by listening. Players want structure but coaches need to know how to implement that structure by knowing his players. 5. Joe, we looked at this picture as you being animated but in reality the loudness of the crowd in Minnesota has much to do with you having to raise your voice, now that the Timbermen has clinched 2nd place in the ALL, can we expect you to save your voice for the playoffs? Sullivan: I wish I could say yes but I’m an animated coach and very passionate about my teams compete level. It’s a testament to the commitment level these players have given, why we will finish in second. Travelling from all over the States and Ontario to make games, video sessions and practices and still participate in our Weekly Youth Clinics is fantastic commitment and sacrifice and I hope in anyway possible I can get more players to the next level. Congrats Joe on your continued development of players and thanks for doing this interview.